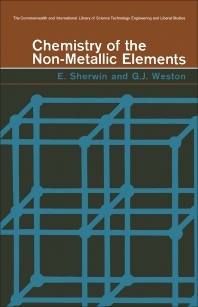 Chemistry of the Non-Metallic Elements is concerned with the non-metals and is to be read in conjunction with The Chemistry of the Metallic Elements by D. M. McC. Steele. The object has not been to provide an encyclopedic coverage of all the chemical reactions of non-metals but rather to select those which will enable the student to appreciate better the similarities and differences between the elements. The book discusses the chemistry of the non-metals in relation to their positions in the periodic groups. It covers the noble gases, hydrogen, the halogens, Group VIB, oxygen, sulfur, Group VB, nitrogen, phosphorus, carbon, and silicon. Where the groups contain metals, as in Group IVA, their chemistry is briefly discussed to show the properties which occur. This book provides a comprehensive treatment of chemistry at the intermediate level, that is, the sixth-form/first-year university level. Readers are assumed to have a background of O-level chemistry and of O- or A-level physics and a working knowledge of elementary mathematics.